We are excited to have you participate in the education offered by our college. Accelerated Undergraduate Degrees are designed specifically for adult learners. We will take your military training and transfer in those experiences as Life Experience Credits. You may have the opportunity to earn up to 30 credits (one year of college) from your various life/ministry/career/military experiences. Like you, the other adult learners in our program exhibit a high degree of maturity with diverse life experiences. We feel this variety adds to the collaborative learning in our courses. LBC is a member of the Servicemembers Opportunity Colleges Consortium (SOC). SOC was created in 1972 to provide educational opportunities to service members. Qualified active duty military students will be charged a reduced rate of $250 per credit hour. Must submit a copy of most recent Leave and Earnings Statement (LES) to the Financial Aid Office. Apply to the Department of Veterans Affairs for your Certificate of Eligibility (COE). While awaiting your COE, apply to LBC for admission. Please note: It could take up to eight (8) weeks for your COE to be approved by the VA. LBC does not have any involvement in this process. Complete the LBC Application & Enrollment Checklist for VA benefits. Thank You for Your Service in Protecting our Nation! Lancaster Bible College participates in the Yellow Ribbon GI Education Enhancement Program (Yellow Ribbon Program) is a provision of the Post-9/11 Veterans Educational Assistance Act of 2008. Yes. 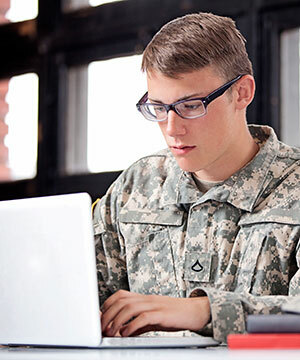 You can use your Montgomery GI Bill for both our online and on-campus options. If you are eligible for the Post-9/11 GI Bill, you may also use that with our college. The Post-9/11 GI Bill pays up to $21,970.46 in tuition and fees. It also provides education benefits for service members who have served a minimum of 90 combined days on active duty after September 10, 2001. Does LBC participate in the Yellow Ribbon Program? Yes. The Yellow Ribbon GI Education Enhancement Program (Yellow Ribbon Program) is a provision of the Post-9/11 Veterans Educational Assistance Act of 2008. This program allows U.S. institutions of higher learning (degree-granting institutions) to voluntarily enter into an agreement with the VA to fund tuition expenses that exceed the highest public in-state undergraduate tuition rate. If your annual tuition would exceed the annual cap please contact our VA certifying official to complete the yellow ribbon application. Does LBC offer a reduced tuition rate for active military personnel? The Armed Forces Tuition Assistance (TA) offered to eligible members of the Army, Marines, Air Force, and Coast Guard covers up to $250 per credit hour for those on active duty. The ceiling for DoD TA is $250 per credit hour. Must submit a copy of most recent LES (Leave and Earnings Statement) to the Financial Aid Office. What if I am at sea with limited online connectivity? Our online courses are asynchronous – you don’t have to be online with other students and/or your professor at a specific time. Typically, your professor will post assignments or discussion questions that are due by the end of the week. Most of your coursework is offline, so you will require relatively little online time to download information and post assignments or discussion responses. Our professors understand the unpredictable nature of your military service and will work with you to help create a schedule for completing assignments around changes due to last-minute military needs. Do I have to come to LBC's campus for any part of my education? There is no requirement to come to our campus to earn a degree from our college. You have the option of attending one of our graduation ceremonies, but if you can’t make graduation, we’ll send you your diploma and all other items you would have received at the graduation ceremony. Can LBC assist my non-military spouse? Spouses of military service members may want to explore aiportal.acc.af.mil/mycaa.